2006-2011 Honda Civic Si Injen Axle Back Exhaust5F. O'HaraAugust 13, 2010Unbelievable difference. I spent a few hours taking off the old exhaust and installing the new one, and I'm glad i did. Huge difference. I love the look of it, the sound and the performance. My car is alot quicker. Thank you guys. 60mm (2 3/8 inches) diameter and 4" tip. 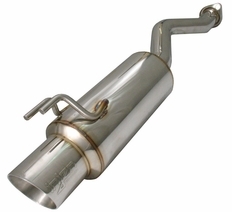 The part number for this exhaust system is SES1577 and it fits 2006-2011 Honda Civic Si models.